“Hello, did you know the American health-care system [Dr. Amy’s note: we can’t even call it health care, it is really “disease care”] is terrible? It is. If you’re unconvinced, here is a chart that demonstrates its terribleness. It shows, using OECD data, how much money different countries spend on health care per person, charted against life expectancy in each of those countries. 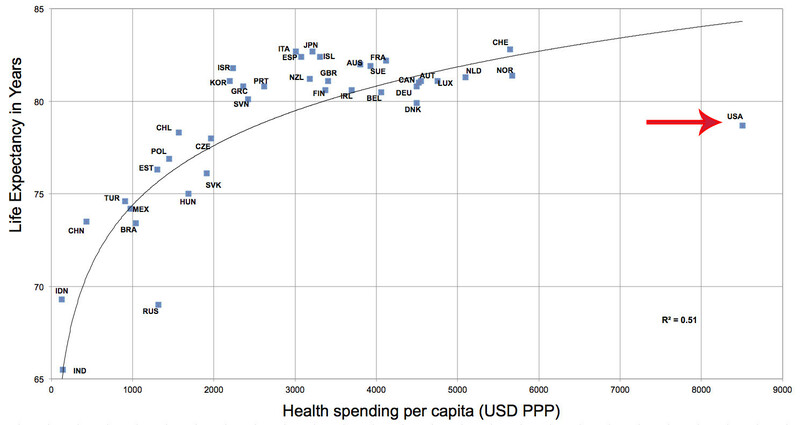 As you can see, there is a pretty close relationship between health-care spending and life expectancy. Except for one very, very terrible country. Can you spot it? Yes, among this group of big countries, the U.S. spends far and away more on health care than any other. And yet it has among the lowest life expectancies of any developed country. People live longer in pretty much every country in Europe, including Greece, where the economy has been wracked by austerity for years. Dr. Amy again here: what is one to do to have better health for yourself and your family within a broken system? My opinion is to utilize the “disease care” medical system as little as possible (5% of the time or less) and to utilize true “health care” activities 95% of the time. Sleep, sleep, and more sleep, you sleep-deprived Americans! We must take our own health seriously and be thoughtful about what “treatments” we decide to undergo. The prize is better health, greater energy, and certainly less cost.